Despite overwhelming political support against his appointment to the U.S. Senate, Roland Burris said Tuesday he plans to take his seat as Illinois' junior senator. On CBS' The Early Show, Burris, who was selected to take President-elect Barack Obama's Senate seat, dismissed his critics, saying his appointment by the scandal-plagued governor, Rod Blagojevich, is valid. "They're causing the drama, my appointment is legal. Are you saying there is something wrong with me? I'm qualified," Burris, who was the first African-American elected to statewide office and was the former Illinois attorney general, said. In his defense, Burris, 71, pointed to Blagojevich's decision Monday to hold an election for a successor to Rep. Rahm Emanuel, D-Ill., Mr. Obama's chief of staff. Burris said it proves the embattled governor still has legal authority to carry out his duties. "As I read the U.S. Constitution," Burris said, it says the "governor shall fill a vacancy, and as a former attorney general of my state, I have no knowledge of where a secretary of state has veto power over a governor carrying out his constitutional duties." Senate Majority Leader Harry Reid, D-Nev., said Monday that Burris cannot take his seat because he "has not been certified by the state of Illinois." 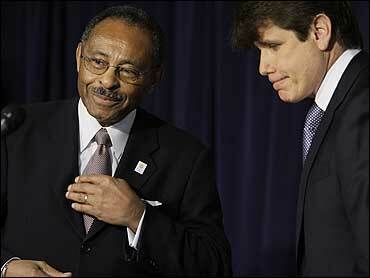 Additionally, Senate Democrats say Burris' appointment is tainted because of the charges Blagojevich faces. Burris has threatened to sue Senate Democrats if they do not swear him in as the chamber's only black member.